Story: Hae-won (Kim Tae-ri) fails her exams and now she feels paralysed. She decides to move back to her home village where she lives in her mother's (Moon So-ri) house who is not staying there herself anymore. She left her daughter alone right before her graduation and has not returned to the house ever since. Hae-won slowly starts to settle back in. She even plants vegetables in spring, although she had only planned to stay in her home village for a short amount of time, until she found out how her life should go on. Even her friends Eun-sook (Jin Ki-joo) and Jae-hee (Ryu Jun-yeol), who she now sees regularly after some years apart, make her want to stay. Eun-sook works at a Bank in a city nearby and Jae-hee has returned to the village and became a farmer after he had had an unhappy job in a big city. The three of them meet up all the time and drink or Hae-won cooks for them. The young student also has a friend in Seoul, who - unlike her - passed his exam. But the longer she stays in the village, the more she realizes that life, and especially the food, is much better there. Will she really manage to cut all connection to Seoul and live all alone in her home village as a farmer? Review: For quite some time now a Japanese movie about a young women who is fed up with the big city life and moves back to the country is waiting to be seen. We are talking about a two-part movie called "Little Forest". Imagine my surprise when I suddenly saw a similar movie from Korea. A remake? No, it is only another movie adaptation of a manga by Daisuke Igarashi. However, its origin is not that striking. We are dealing with a quite drama, in which apparently nothing really happens, and you might be afraid that this could make you fall asleep after a while. But "Little Forest" radiates so much warmth and comfort that you'll want to move to the country yourself. Not only the idyllic surroundings but also the wonderful relationship between the three friends make you soak up the beautiful atmosphere and you just feel at home. There is a lot to be seen in this drama. 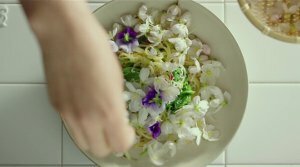 Repeatedly the movie proves to be some kind of cooking journal and we see traditional Korean meals, which you only get on the countryside, in razor sharp pictures. Especially Western audiences will be amazed and most probably they'll want to look up a recipe or two. Nevertheless, "Little Forest" is no cooking movie, the cooking represents some kind of meditation, though. It slows down everyday life, reduces stress and helps you look for answers to the most important questions in life. We even learn something about growing vegetables. Like Jae-ha, played by Ryu Jun-yeol ("The King"), says at one point: this kind of work might be physically demanding but he is never stressed whilst doing it. Which is completely different from his former job, in which he was never even allowed to make any decisions by himself and his boss constantly criticized him. As an audience you easily start longing for the idyllic world presented in this movie. The reason for that might also be the glorified picture portrayed of the country life. We do not really get to see the harsh and cold winters and the crop failures we do get to see, don't seem to bother the farmers all that much. Besides, Hye-won is not alone, she has her school friends with her, which is unusual, as it is a well-known fact that young people always move to big cities. This is where you can see the Koreans' desire for escaping the dog-eat-dog society as well as the lies and deceptions and how they long for a simple, "pure" life. The movie also downplays old people's constant nagging and search for attention in a village like this. Instead, we get cozy get-togethers at the moonlit lake and funny conversations, which are so fresh and authentic that we might think we are watching a documentary. We have to thank Kim Tae-ri ("The Handmaiden") for this, as she provides Hye-won with the complexity she deserves. She runs away when she fails, gives out advice that she cannot even follow herself and loves and hates her mother at the same time. By the way, her mother is presented in flashbacks and is played by the brilliant Moon So-ri (also to be seen in director Yim Soon-rye's "Forever the Moment"). The mother portrays a specific kind of wisdom and strength, which might disguise a deep desire. You do not get all the answers in this movie, but enough not to get frustrated. In fact, "Little Forest" avoids everything that might be frustrating. There is the love triangle between the friends. Here, things could have gotten frustrating quite easily, but director Yim manages not to let the subplot turn into a simple drama. The three friends are incredibly charming and lovable. Jin Ki-joo manages to bring something fresh into the movie as Eun-sook and adds a lot of humor to it. It is actually wrong to call "Little Forest" a drama, because despite of topics like life crisis, separation or unrequited love, you just get harmony. But not in a tacky kind of way. Splitting the movie in four chapters, representing the four seasons, not only creates beautiful imagery of nature, but also gives us an insight into the circle of life and what is really important. With that, director Yim Soon-rye ("Whistle Blower") managed to create a quite but not at all boring movie, which subtly makes us question our place and our luck in today's society and emphasizes a nature romanticism which mesmerizes and warms your heart. After "Little Forest" you just have to feel good.